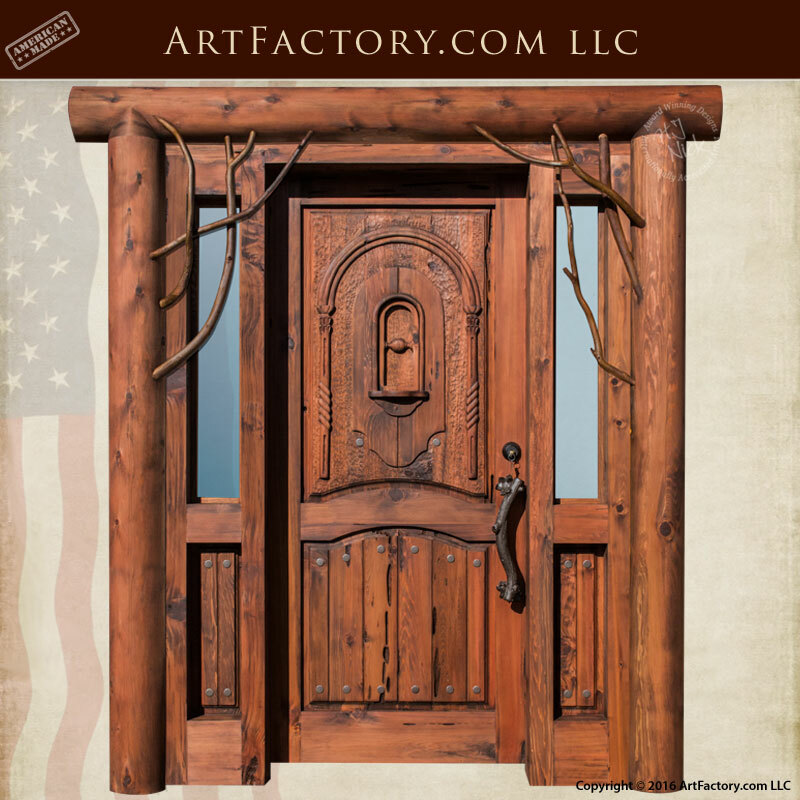 This beautiful hand carved, custom log cabin door, as shown, is made from the best American cedar cypress (all wood species available). Featuring a functioning speakeasy for the old world feel and sidelights that add a modern and stunning design for your log cabin or home. Curved branch door pull and clavos is all hand forged solid wrought iron made by our master blacksmiths employing mortise tenon joinery construction. Topped off are tree twig embellishments that contribute more to the log style theme. We are so confident in the quality of our products and craftsmanship that all of our doors are guaranteed forever. We create our doors using original craft, meaning no glue, no veneers, and no laminates, only solid wood that is joined using mortise and tenon. Our custom wood entry doors are affordable and guaranteed forever and backed by over nine decades of fine craftsmanship. Give your home the solid wood entry door it deserves. Call us today at 1-800-292-0008 for pricing on this custom log cabin door, or any of our other fine art quality custom entrances.